2 Bedrooms / 2 baths CONDO, that sleeps 2-6 guests. “Moose Lodge” is located in Summit County Colorado in the town of Frisco. Unit 112 B is in Ten Mile Condominiums. This is a ground floor end unit and with the extra windows it gets more natural light. Free WIFI is included in this well-appointed 2 bedroom 2 bath condo. Some of the July 2014 upgrades are, the old fiberglass tubs are gone and have been replaced with tile showers, we have added 600 count sheets in the master bed room for the king bed. Granite counter tops in the kitchen with subway tile backsplash. The kitchen is stocked with all the pots and pans and everything else you would need. From the rear patio deck there is Ten Mile Creek and mountain views of Mount Royal. This comfortable condo has the ambiance of a mountain lodge that is comfortably arranged and nicely furnished. Ten Mile Condo is a quiet and small well-kept condominium complex that backs up to Ten Mile Creek. The clubhouse has a TV, kitchen and dining area for family reunions, there is a pool, a hot tub and a sauna for relaxing. The free Summit Stage is a 3 minute walk from the front door. There is a 42' HD TV with a Blu-Ray/DVD player in the family room and a 32' TV in the master bedroom. Wireless internet is also in the unit. **We do not recommend our unit for 5/6 adults or groups looking for a 'party location.' This is a well maintained and monitored complex! We like to come up here to relax. At times it will be hiking, biking or taking walks. Other times is will be sitting on the deck listening to the creek and reading books about hiking, biking or taking walks. We love Ten Mile Island Condominium because it is a small and family type place. It has everything we want the privacy or the amenities of the clubhouse. Plus the bonus is that we can park our car and walk or bike to what ever we want to do. The stream that runs out the back deck and with the backdrop of Mt Royal it is a quite amazing view. Washer and dryer in same building a few steps away. 2 TV one in the family room, 1 in the master bedroom. TMI has free bikes to share. A great place for 2-4 people to stay near skiing in CO. The Frisco location is prime. Near HWY 70 but you can't hear the freeway at all. Within walking distance of dozens of eating places and pubs. The place itself was clean and comfortable. The beds were comfortable as was the small living room. The kitchen was well appointed and there was a outdoor gas grill available too. My only complaint is that the flat screen TV was not in hi-def mode. I recommend that the owner hook it up that way for future guests. We did bring a laptop with HDMI out and a HDMI cable, so we did have the ability to watch a clear picture. Plan to stay there again next year. We returned to the same Moose Unit this Spring Break 2015 because we enjoyed our stay last Spring Break 2014. The owner is very responsive to my emails, very easy to make arrangements with him. 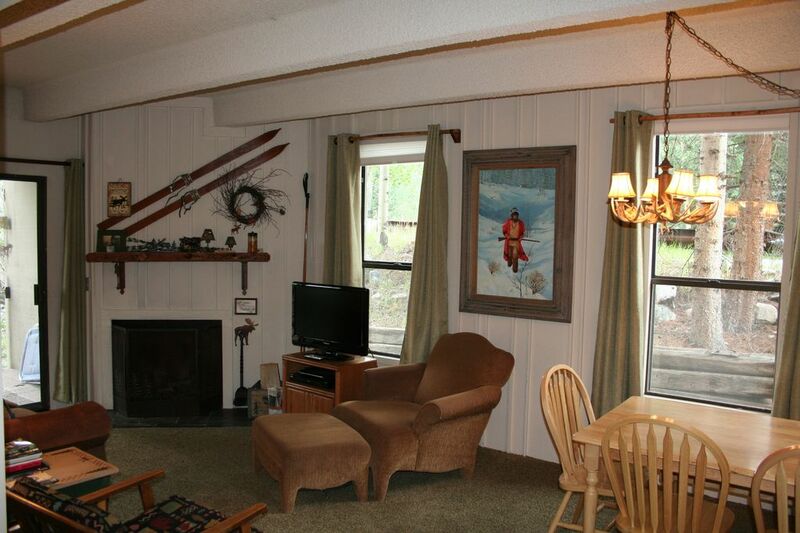 The unit is very cozy, perfect size for our family of two adults and three teenage children. The kitchen is well equipped for making our meals. The furnishings are comfortable; the decorations are quaint. The clubhouse has a nice size pool, hot tub, and sauna. We had a wonderful stay again. I highly recommend this unit for rental. We loved our stay in this condo in Frisco, Colorado. We had plenty of room for four adults. Loved the babbling brook and patio for "happy hours". Used the grill and well equipped kitchen for some great home cooked meals. This condo is located close to the bus that transported us for skiing. We would definitely stay here again. Very close to Copper mountain. Hot tub great after skiing. Property in excellent condition. My questions were answered almost Immediately. Would stay again! I just wanted to say thank you for a wonderful, clean place for us to stay on our cross country ski trip. The condo had everything we needed and worked out great for us. I really liked being on the ground floor! Thanks again! Just wanted to take a moment and thank you Doug for having a wonderful place for us to stay on our vacation. We didn't have a single problem. And your place has everything you could possibly need. Frisco is a fantastic little town and close to everything. You have all the mountain, lake and stream activities. There also are many museums nearby.